That is, until February 2011, when Marvel released a Big Shots teaser promising a new DAREDEVIL title in July. The creative team was blacked out. 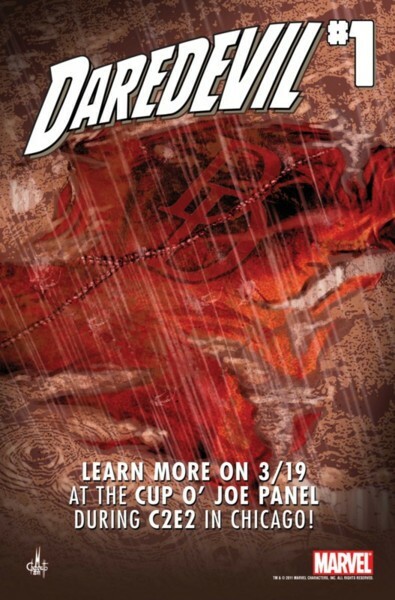 On March 19th, 2011, at C2E2, the announcement all DD fans were waiting for finally came... Mark Waid, Paolo Rivera and Marcos Martin were going to relaunch DAREDEVIL. By April, DAREDEVIL: REBORN was ending and the first glimpse of what to expect from the new series came with the solicit for DAREDEVIL #1. DAREDEVIL #1 would ship with 5 covers by Paolo Rivera, John Romita, Marcos Martin, Neal Adams and a blank cover. Estimates for sales were around 65K. With issue #1's release, Marvel also produced an audio edition of the comic, with Waid, editors Stephen Wacker, Tom Brennan, Ellie Pyle and Jordan White, and Marvel.com editor Ben Morse providing voices. 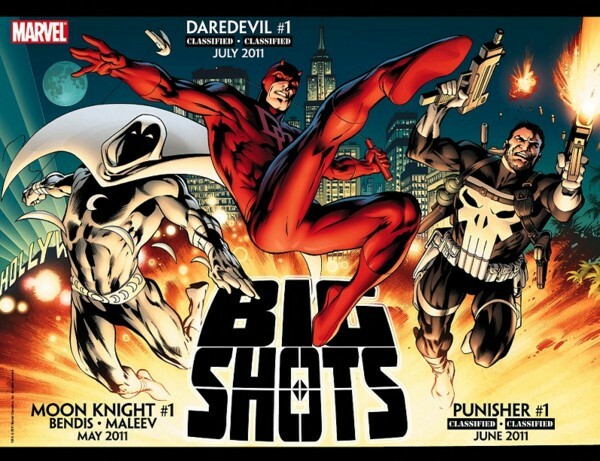 By the end of the year, with about 7 issues out, DAREDEVIL was selling well and appearing on many Top Comics lists of 2011. By 2012, news came that artist Marcos Martin was leaving the book and Chris Samnee would come onboard, joining Paolo Rivera as the rotating art team. Artists Khoi Pham, Kano and Marco Checchetto also provided some artwork for some crossover and "fill-in" issues. In April, DAREDEVIL was nominated for 6 Eisners, winning 3 (Best Single Issue, Best Continuing Series and Best Writer). Michael Allred was announced in May to draw issue #17. In June, artist Paolo Rivera stepped down from his DD art gig, but continued to provide covers. DAREDEVIL was also nominated for 8 Harvey Awards, winning 4 (Best Inker, Best New Series, Best Continuing Series and Best Writer). October brought news that DAREDEVIL would be ending with issue #36. DD fans didn't have to wait long, as DAREDEVIL #1 was announced in November, coming out one month after issue #36. Daredevil would move to San Francisco. In the meantime, a new digital Infinite Comic by Waid and Peter Krause would bridge the gap called DAREDEVIL: ROAD WARRIOR. And that's where we are now, with issue #36 out this week... it's been quite the 3 years of DAREDEVIL. What did it mean for these talented people to work on DAREDEVIL Volume 3? "It meant everything. Not only was it one of the most creatively satisfying experiences of my life, but thanks to Steve Wacker and his murderer's row of artists who are brilliant collaborators, it revitalized my entire career." "Awww... Kuljit, just run the same answer for everyone!!!" "Daredevil was one of those once-in-a-lifetime opportunities where I got to work with the best in the business on something that was dear to my heart. Not only was every issue a joy to work on, but the experience catapulted my career in ways I never could have expected. Daredevil has a rich creative history at Marvel and I feel privileged to be a part of that." "Personally, it was a real thrill to work on a comic book and to work with my son Paolo. I've watched Paolo progress as an artist from when he first picked up a pencil. So it is great to see him succeed at his chosen profession. It worked out much better than we had hoped. I was also surprised how well I was received into the comics industry. Professionally, is a tougher question because I was never in the comics industry before or had much desire to get into it. It was very enlightening as to how comics are produced. I read comics when I was a teen and I knew a little about such things as penciling and inking but not much else. I've been an artist my entire life and worked in various media. Now I am looking to do more work with Paolo and maybe a graphic novel." "To me Daredevil is the best comic-book that I've been involved with till now. Lovely character and fantastic creative team. Let's see if vol. 4 is better!" "As a letterer, it was the single most positive experience of my career. As a fan, it was the Daredevil book I always wanted. I'm grateful that they asked me to stay on for the next chapter in the series." "Daredevil is the character who impacted me the most as a teenager. I still remember the day I was reading the first issues of Miller on the beach like it was yesterday. Personally, it's the character that impresses me more to draw. My childhood fantasy is still drawing comics that impacted me as a child, such as when I copied drawings at that age, so I can professionally say that participating in a few pages in the history of this character was a pleasure and an honor. Moreover because of the tone of Waid's script, who gets the best of the time that I started reading superheroes." "Working on Daredevil was a real treat for me. When asked what my favorite comic story ever is, I often find myself talking about Miller and Mazzucchelli's Reborn issues. So yeah, personally, it was awesome to be a part of that legacy, even if for a small bit. Professionally, working with Mark Waid, Javier Rodriguez, and Steve Wacker and the editing team was a real treat, especially knowing and loving the look and feel of the book already established by Paolo Rivera and Marcos Martin. It was fun for me try out a more loose and open approach to the line work. A great experience altogether." "I've been a Daredevil fan since I was a kid and had been rabidly following Volume 3 from issue one. It's felt like a dream come true to work on one of my favorite characters with one of the best writers in the business-- not to mention have it be so well received by fans and critics alike. I couldn't wish for a better group of folks to make comics with. And I'm so glad it was on Daredevil." "I pretty much have made a career out of extending everything I loved as a child. Daredevil was the character I pretended to be when I swung and hung upside down on the school play yard monkey bars. So, drawing him in any capacity would have been great fun, but after seeing what Mark was doing with the series and with some of my favorite artist pals, (Paolo, Marcos, and now Chris), I had to tell 'em I loved what they were doing. Being asked to join in and play was simply pure joy." "Working on an issue of Daredevil was a dream come true. Getting to work closely with one of the best DD crew to ever grace the book was just the icing on top." "Daredevil is my favorite Marvel character and this was the first launch I worked on when I started at Marvel. Stephen Wacker had assembled the absolute dream team of Mark Waid, Paolo Rivera, Joe Rivera, Javier Rodriguez, Marcos Martin and Muntsa Vicente so (as Steve reminds me often!) I was pretty much the luckiest assistant editor ever. The talent has remained exceptional across the board but what resonates with me most at the heart of this volume is Mark's vision of Matt's fearlessness manifesting in a determination to say "enough" in the face of his life's darkness and keep moving. As we head into volume 4 with Mark Waid, Chris Samnee, Javier Rodriguez and Joe Caramagna (who lettered every issue of volume 3) I still feel like the luckiest editor around."